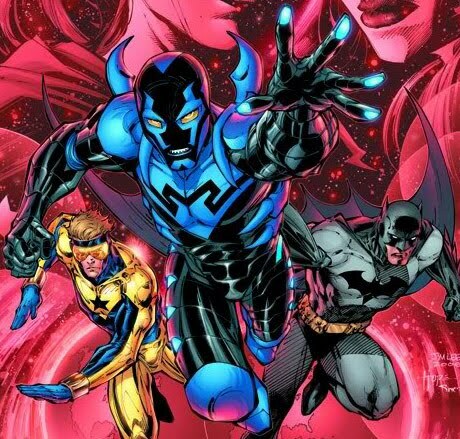 BLUE BEETLE NEWS from DCE!! We have a live-action test of Jaime Reyes’ scarab activating his suit. It. Is. Awesome… we’re hoping to develop a live-action show. Fingers crossed! Obviously the plans are still in the early stages, but this would be an incredibly cool property to bring to life - and even possibly work in the legacies of the prior Blue Beetle's, to really give it that full DCU flavour. Jaime Reyes, a Texan high-school student, discovered he had the ability to become the Blue Beetle, after the Blue Beetle Scarab grafted itself to his spine overnight. Giving Jaime acecess to its fantastic powers and armour, the scarab can also take control and use its powers for its own defense and purposes. Currently Blue Beetle is a reoccurring guest on hit-cartoon: Batman: The Brave and the Bold. This cannot get enough promotion. Yeah - I agree Doug. I just love the next rows back getting a dust off... I mean even Resurrection Man lends himself well to TV! I could see that as a TV series, no problem. The CW would need something on the schedule to fill the Smallville slot! Not only would it be a great TV series, it wouldn't have to be altered too much from the original story (just leave OUT some details) to make it viable. The scarab's aversion to Green Lanterns would make this well-timed to follow-up after the GL motion picture.